Not everyone can look back on a 20 year career and say “I am doing the job I was meant to do.” Rita Fox can, and her physical therapy patients are SO thankful that Rita’s path led her to Heritage Integrative Healthcare. Rita realized at a young age that she is a healer. When Rita learned about the power of physical therapy and its potentially life-changing benefits, her path was clear. Rita’s connection to the patients and therapists during her volunteer experience led her to enroll and graduate from the Physical Therapy program at the University of New England. Rita strongly believes that each individual patient should be looked at holistically, and that body, mind, and spirit are all part of the wellness equation – a perspective that is reflected in all areas of practice at Heritage Integrative Healthcare. Rita’s one to one approach with her clients allows time for more than manual therapy. Rita educates her patients, and she watches them move. She provides patients with rehabilitative exercises while talking to them about life stressors or emotional components that might be affecting their ability to heal. Rehab shouldn’t be impersonal, boring, or painful. Rita invites you to Heritage Integrative Healthcare to experience their holistic, personal approach to patient care and wellness. Rita received her degree in Physical Therapy from the University of New England in 1998. 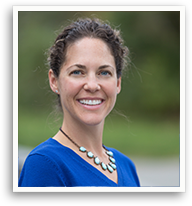 She has experience in a variety of settings including outpatient orthopedic manual therapy, acute and skilled rehabilitation, and home health. Rita worked for Mercy Hospital in Portland for 10 years prior to joining Heritage Integrative Healthcare full time.